The blessings of Faiz ul Mawaid Al Burhaniyah (FMB), the community kitchen of the Dawoodi Bohra, are too vast, intangible, far-reaching and innumerable to recount. 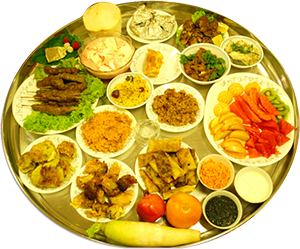 All over the world, 90,000 Dawoodi Bohra households receive this �Thaali� and partake gratefully from this fresh, home-like, one-time meal. This herculean task is a realization of the dream of his holiness Dr. Syedna Mohammed Burhanuddin RA that no believer should remain hungry and the manifestation of Syedna Muffadal Saifuddin TUS endeavors. However, the facets of planning and execution which go into the preparation and dispatch of Faiz ul Mawaid Al Burhaniyah, are uncountable and complex. Thousands of Mumineen, mumenaat and children work, volunteer and contribute each day tirelessly so that the Faiz ul Mawaid al Burhaniyah Thaali may reach their brethren on time.